I hear news from frozen Michigan that Professor Motor will make a vintage style, 1/24 brass rod chassis to go into a kit with their repro MPC Indy Offy bodies. Andy sent me pictures of a prototype chassis, and it's a thing of beauty! I guess I'll have to get in line for one. "The chassis is constructed from the PMTR5012 stamped brass motor bracket and the PMTR5013 stamped brass drop arm. A 7/32" brass tube is used in the rear to allow for 3/16" OD bushings and the 5/32" front tube allows the 1/8" axle to rotate and slide freely ala Champion. The motor bracket used here has a 1/16" offset built in on one side, and this is used to lift the motor and allow for the larger 1/24 tires." 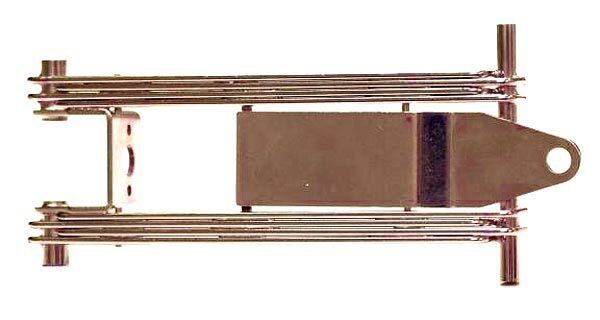 "Construction was done on a "Lucky Bob" Corion chassis jig with stainless steel pins pressed in (made from TSRF axles) for fixturing. A "reverse" style guide will be used in these kits to keep the guide neatly under the skinny body. 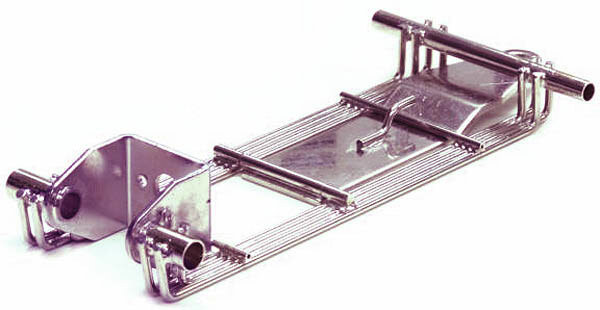 All RTR kits will have nickel plated chassis as shown. An unplated and unassembled kit will also be offered."